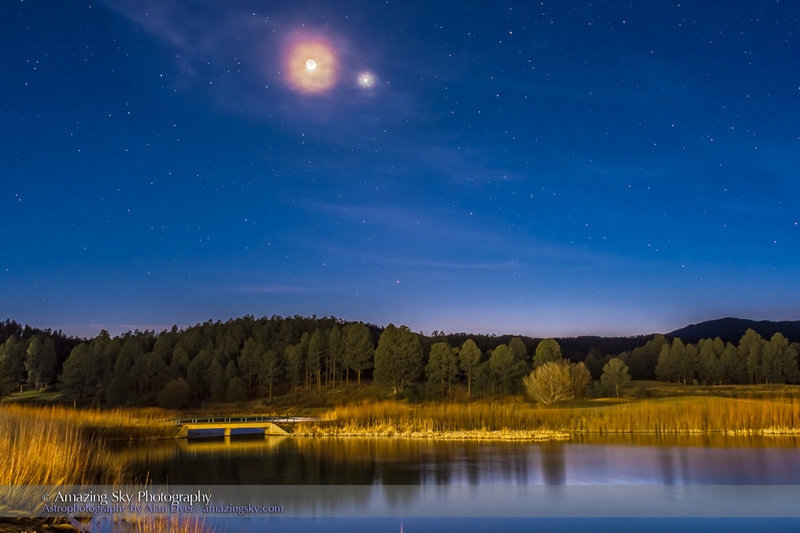 The waning Moon shone near the bright star Aldebaran in the dawn sky. This was a beautiful sight this morning, before dawn on July 29. The crescent Moon, its night side illuminated by Earthshine, shone just below the brightest star in Taurus. We are currently in 3-year period when the Moon’s path is taking it near or in front of Aldebaran every month. However, most of these occultations or conjunctions are not well-timed for any particular location. And many involve the too-brilliant gibbous or full Moon. But this morning the timing and Moon phase were perfect. From my longitude on Earth in Alberta, the Moon passed closest to the star just before the sky was getting too bright with dawn. Having them set against the deep blue twilight was perfect. From farther east the Moon would not have appeared as close to Aldebaran as this before sunrise. From farther west the Moon and star would have appeared much lower in the sky at closest approach. For this image I shot 6 exposures, from 2 seconds for the Earthshine, twilight sky colour and stars, to 1/125th second for the bright crescent. 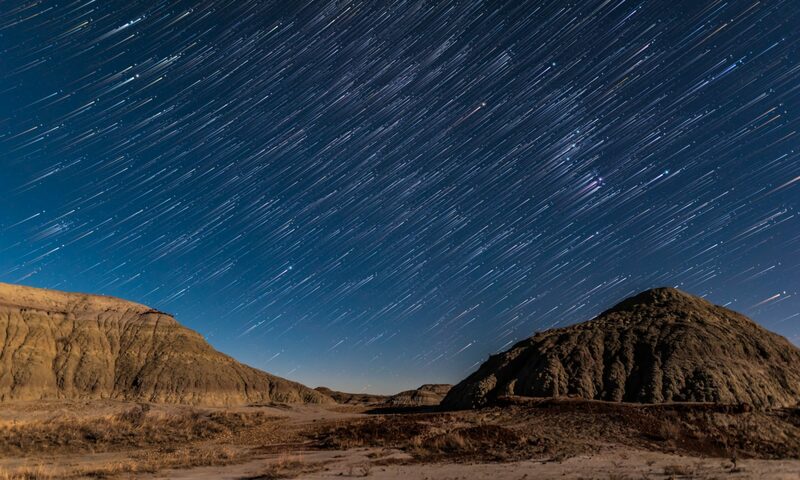 I then stacked, aligned, and blended them together using luminosity masks – masks that hide or reveal parts of the image based on the brightness of the scene. You can see them in the Photoshop screen shot – Click on the image to enlarge it. How do you create these masks? • Turn off all the layers except the one you want to create a mask for. • Go to Channels and Command/Control Click on the RGB Channel. • That automatically selects all the highlights. • Go back to the image layer and then hit the Add Mask button down at the bottom of the Layers panel (the rectangle with the black dot in it). • Done. Repeat that for each image layer. More traditional high dynamic range or “HDR” stacking left odd colour fringing artifacts and double images on the slowly moving Moon, despite applying what is called “de-ghosting” and despite using a mount tracking at the lunar rate. I tried merging the images with HDR, but it didn’t work. 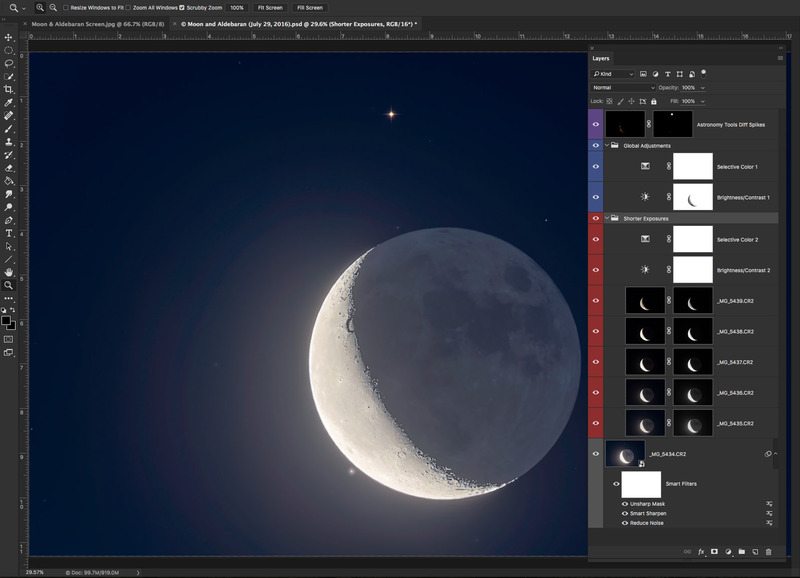 A nifty Photoshop action from the Astronomy Tools set by Noel Carboni added the diffraction spikes. 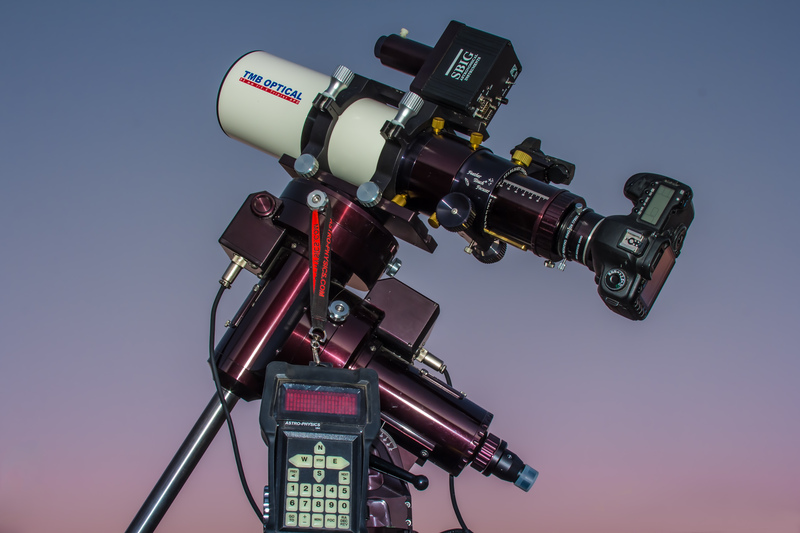 I shot all images with the 130mm Astro-Physics refractor at f/6 and the Canon 60Da camera at ISO 400. 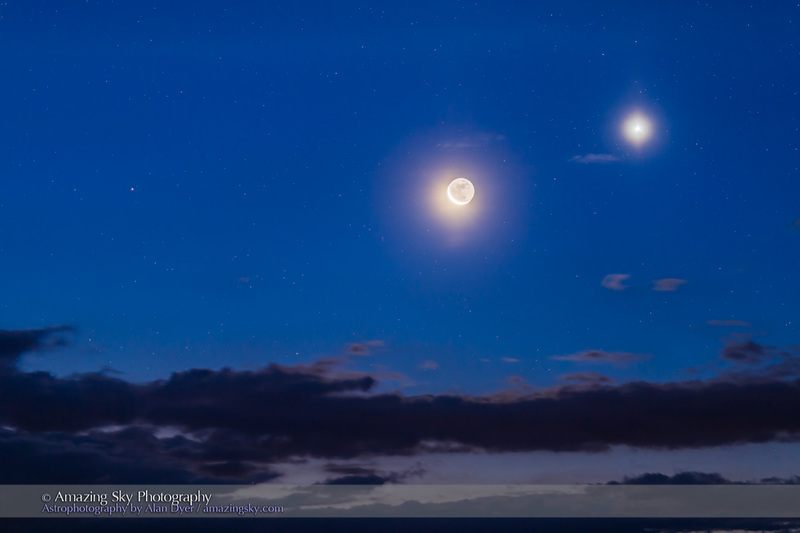 On the evening of April 21 the waxing Moon shines near Venus, while Mercury appears near Mars. Say goodbye to the winter sky, as Orion and Taurus sink into the western twilight. Joining them is an array of planets, and the Moon. Look west on April 21 and you’ll see the waxing crescent Moon near brilliant Venus, with both above the Hyades star cluster and the bright star Aldebaran in Taurus. 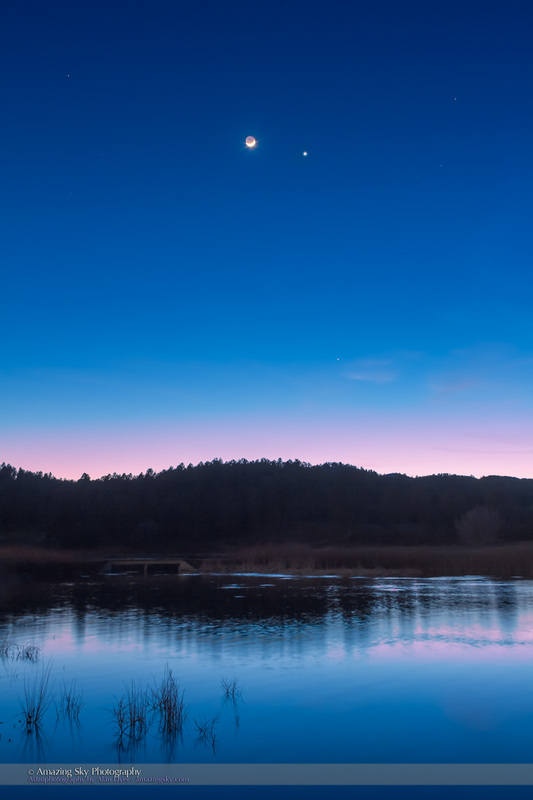 The thinner Moon will appear below Venus the night before, on April 21, while on April 22, the waxing Moon, then a wider crescent, will sit well above Venus. If you have an unobstructed view to the west also look for the pairing of Mercury and Mars low in the twilight. You might need to use binoculars to pick them out. Mercury is just beginning its best evening appearance of the year for the northern hemisphere. So if you miss it April 21, you have another couple of weeks to find it in the evening sky. 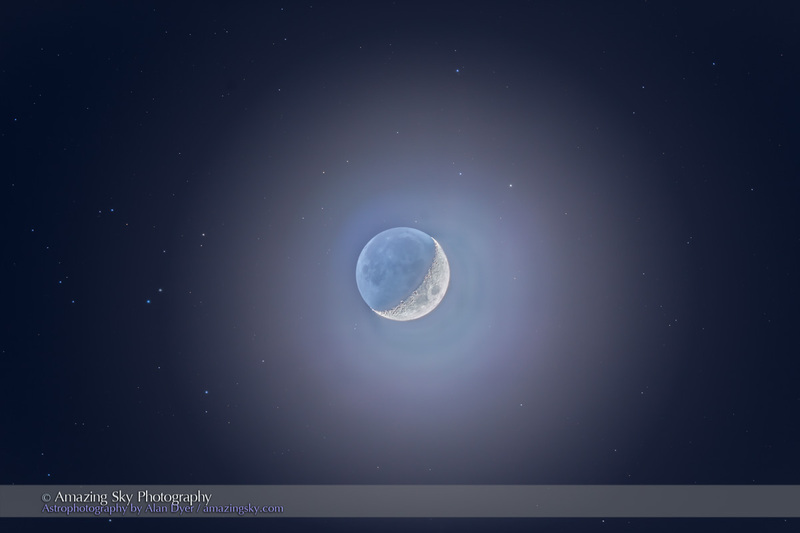 On the nights around April 21, also look for Earthshine lighting the dark side of the Moon. 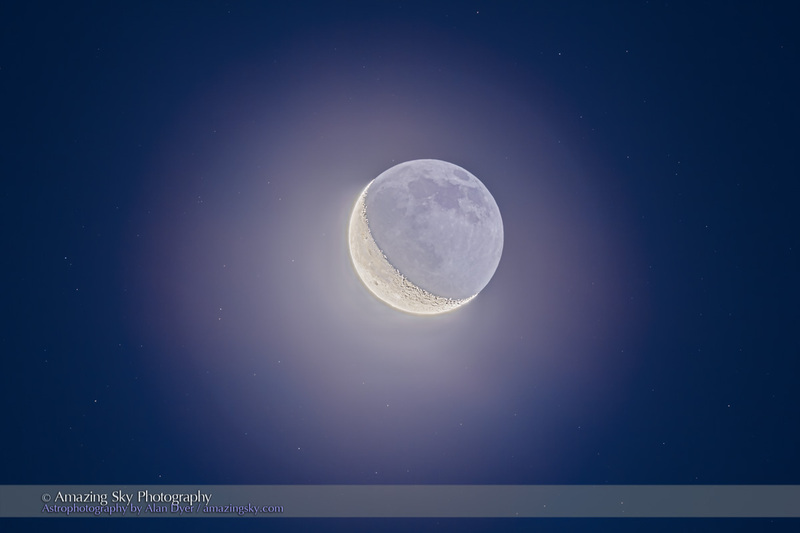 You can see the night side of the Moon because it is being illuminated by sunlight reflecting off the Earth, shining brightly in the lunar sky. 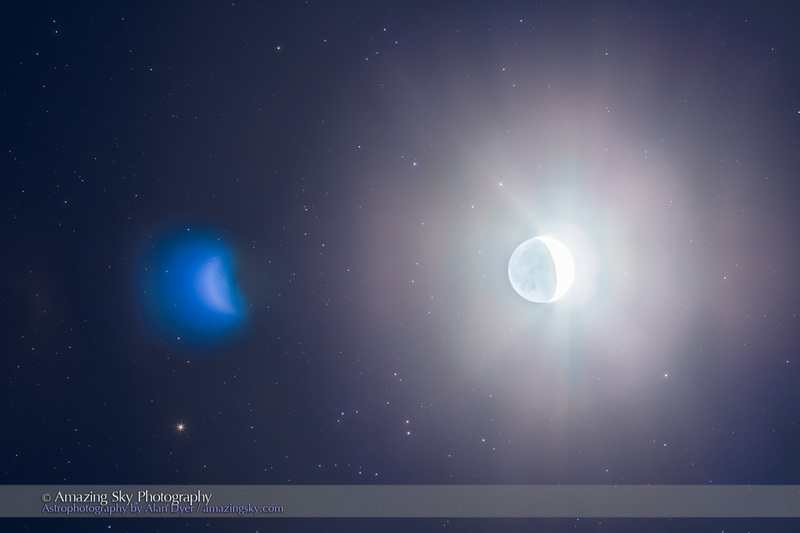 The above image is a view of Earthshine from a month ago, on March 24, when the Moon appeared in the Hyades star cluster. 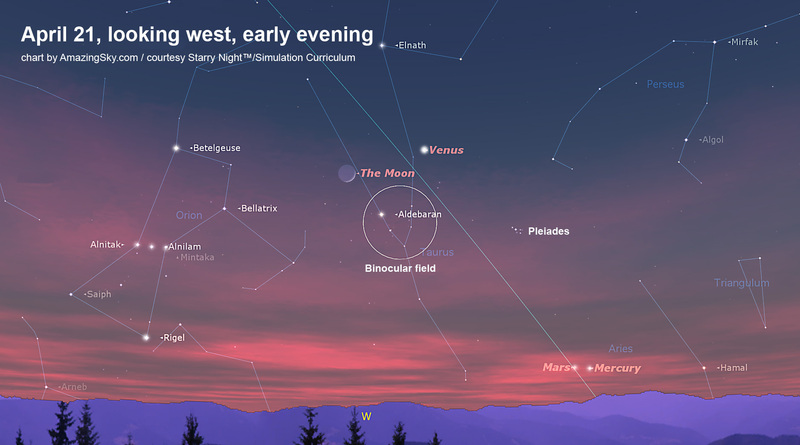 Enjoy the spring sky adorned by Venus as a bright “evening star,” and joined by the Moon on April 21.